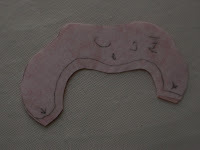 Second, if two appliqué pieces will share edges, it is best for one piece to overlap the other. Determine which piece would naturally fall on top or in front of the other piece. When cutting out the background piece, I like to add small arrows along the line of the edge that will fall underneath another piece. This tells me that I should add 1/8". 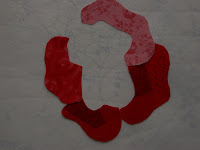 Sometimes it is easiest to fuse some applique pieces together before placing them on the background. 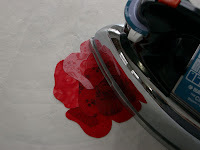 You'll need a teflon pressing sheet and an iron set to the temperature require for your chosen fusible product. Begin by placing your freezer paper marking guide wrong side up on the ironing surface, and the teflon pressing sheet on top of it. 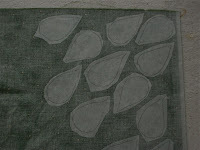 Note that you can see the lines of the appliques through the pressing sheet. 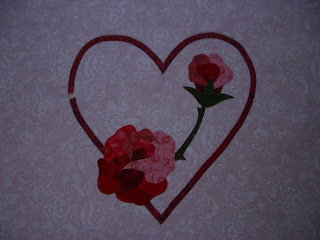 Remove the paper backing from your appliqué pieces, and begin building your appliques from the background up. The roses in this block are the kind of units that you can build. Start with A, then place B, C, D, and so on in order. 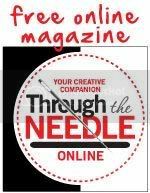 Use the freezer paper marking guide for placement. 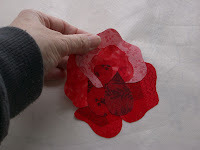 When all the applique pieces are in place, adhere them to each other with the iron, let the piece cool, then carefully remove the entire unit from the teflon pressing sheet. 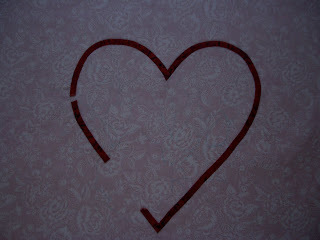 It is now ready to place on your marked background. Make both rose units in the same way. 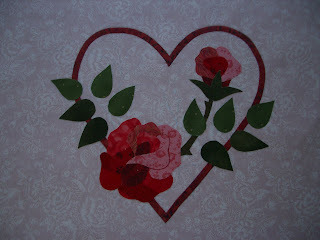 For the February block, you will applique the bias heart shape first. 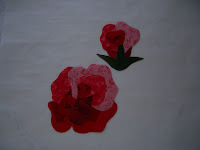 Then, place the appliques on the background in this order: Rose stem, rose units, and finally the leaves. 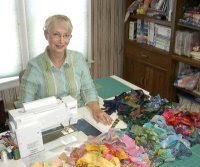 Now your block is ready for the blanket stitched edges, embroidered leaf stems, and lazy daisy filler flowers. 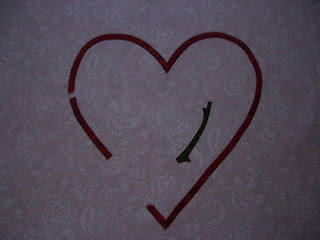 I love your BOM, but I have a little problem with the Feb. How do the pieces of the rose glue together? Did the teflon iron sheet do it? 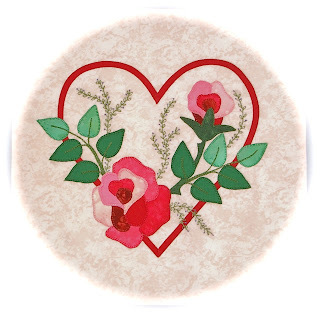 Gunda, if you read instructions provided with the block pattern, you will see that you are to use a paper-backed fusible product for your pieces. 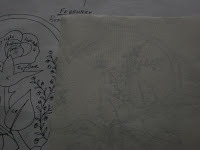 Remove the paper before placing the pieces on the teflon pressing sheet. The heat of your iron will fuse the pieces together. The teflon sheet will allow the fused unit to be removed with the fusible still in place on the wrong side of the unit.